1st folio of EAP 676/2/5. Now. Pañcaviṁśatikā Prajñāpāramitā is Sanskrit for the 25,000 line Perfection of Wisdom, literally it is The Perfection of Wisdom which is 25,000-fold. 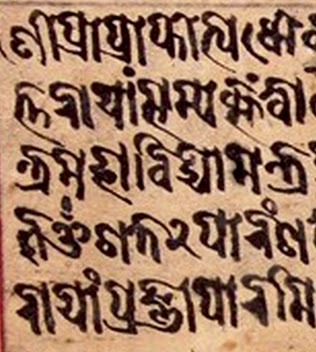 Not 'verses', note, since only one Prajñāpāramitā text is in verse, the Ratnaguṇasamcayagāthā, and it is not referred to by the number of verses. These texts with numbers in their names are all in prose and the number of lines they take up depends on the length of the line and the handwriting of the scribe. What really peaked my interest is the last word, dhāraṇī, because the Heart Sutra is sometimes referred to in Nepalese manuscripts as the dhāraṇī of the Pañcaviṁśatikā Prajñāpāramitā. This text is in Bhujimol Script which is one of the Nepalese 'hooked' scripts - they have a curl on top instead of a line. I have learned this before, even have read the Heart Sutra in Sanskrit in this script (one of the Cambridge Manuscripts) so I could make out enough of it to be confident that it was a long-text Heart Sutra. I set about transcribing the whole text and then comparing it to Conze's critical edition (both his selected text and variations). Since this manuscript is in a private collection in Nepal I thought it unlikely that Conze could have seen this one or used it in his edition. And this turns out to be the case. This manuscript has not been studied before to the best of my knowledge. The manuscript is in reasonably good state of preservation, the paper is not blemished, mouldy or torn. There is some smudging of ink, but for the most part even the smudged akṣaras are readable. A quick note about the word 'akṣara'. This word refers to a unit of Indic writing. In this type of text, akṣaras are not written joined up, each stands alone, meaning there are no word breaks. An akṣara represents a graphic unit rather than a spoken syllable, usually a single vowel, or one or more consonants followed by a vowel (we say pad ma, but write pa dma). Since each akṣara is a single graphic unit, they are often called 'letters' though I think this is also imprecise. I favour using the Sanskrit term since it is more precise. A few akṣaras in our text are difficult to read because of the handwriting, or smudging, but can be inferred from the context and what remains on the page. Only one akṣara was completely un-guessable, since it is both obscure and seems to have been added by the scribe in error and is out of context. Some marks on the paper appear to have been deliberate, but are of uncertain meaning or function. Given the huge numbers of omissions I think it reasonable to conjecture an omitted word between prajñāpāramitā and samāptaḥ, namely hṛdaya. This occurs in almost all of the other manuscripts. Most importantly, nowhere on the manuscript is the title: Ārya Pañcaviṁśatikā Prajñāpāramitā Mantranāma Dhāraṇī (nor does Conze list this precise variant in any of his witnesses). My title for the work would be Ārya-pañcaviṃśatika-prajñāpāramitā-hṛdaya, though many of the other Nepalese manuscripts do refer to the text as a dhāraṇī, and it's very common to find it written along with the Uṣṇīṣavijaya Dhāraṇī. The text is highly error ridden and there would be no point in simply sharing an unedited transcription, so I have produced a diplomatic edition. I have commented on the text at more than 140 places, which means on average I have commented on one word in two: a remarkable level of corruption given the supposedly sacred nature of the text. Some errors seem to have been introduced by the scribe. For example, the sibilants (ś ṣ s) are frequently mixed up; l and r are exchanged without pattern; anusvāra (ṃ) and visarga (ḥ) are added and subtracted without pattern. Another regular error in this ms. is vya for ve. This kind of error is corrected in my edition. Nepalese manuscripts also regularly write sattva as satva, and have ryya for rya and rvva for rva, though EAP676/2/5 is inconsistent. These errors are not corrected, since they appear to be features rather than bugs. Word endings also vary without pattern and these have been normalised, following Conze 1967. Occasionally, extra syllables have been added, and at one point a phrase seems to be copied twice (the scribe's eye may have drifted between lines). These appear in my edition with a strike-through. More often syllables, words and phrases have been omitted. All changes have been noted. Of course, it's possible that our scribe was simply copying a manuscript that was already corrupt. Thus these scribal errors can become generational. These types of errors become apparent when comparing many mss. And they help to establish relatedness amongst manuscripts. If two mss. have the same scribal error, the chances are they were copied from a single mss. which contained that error. We presume that the regular doubling of yya in ārya was an early scribal error that has since been propagated across Nepal as a feature. One thing to note in comparing any text to Conze's critical edition is that he sometimes simply ignores witnesses that are very corrupt even though he lists them as variations. I have found about half a dozen omissions great and small to date. As such, his critical notes are incomplete to an unknown degree, and unreliable. Some of the changes are not errors, but editorial decisions. For example, the usual way of saying "at that time" is tasmin samaye in the locative case. This is also seen in the phrase ekasmin samaye 'at one time". In the first para, after the Buddha goes into samādhi, Avalokiteśvara becomes the main protagonist and he is introduced using tena samayena which also means 'at that time' but uses the instrumental case. However, in EAP676/2/5 some previous editor has changed this back into the locative. Such changes are not 'corrected' except where a scribal error has crept in. This change is also seen in a number of mss., using Conze's enumeration: Nd, Ne, Ni and Nm. Thus, when we come to try to figure out the lineage of all the surviving mss., something I hope to do some day, then we'd expect these mss. that share this feature to be more closely related to each other than to other mss. Similarly, for the idiom "tasmāc chāriputra". This spelling comes from the action of sandhi rules on the two words tasmāt śāriputra. Our text prefers tasmāt tarhi kulaputra or tasmāt tarhi śāriputra. This kind of change couldn't be the ms. equivalent of a typo. Someone must have decided this was "better". In this our text is like about half of the Nepalese mss., and the Tibetan. Conze's reference to the Tibetan is to a single unnamed source. Jonathan Silk has shown two distinct recensions with many variations exist in printed editions of the Tibetan canon. Thus in comparing the texts we'd have to use Silk's critical edition of the Tibetan to see which recension our text is like. Note that auṃ is unusual in a Buddhist ms. In the second mantra (see below) we have the usual oṃ. Perhaps the scribe was used to seeing auṃ and we might conjecture that they also copy Hindu texts. I've put a strike through akṣaras added in error. The misplacing of anusvāra (ṃ) is a feature of these mss. They are added and subtracted seemingly at random. The scribe has added -satva to bodhi. This mistake is not found in other Heart Sutra mss. Another unique feature of this ms. is that it is followed by another mantra in Lantsa or Ranjana script, by what appears to be the same scribe (it's difficult to tell). The mantra is introduced with an invocation of Avalokiteśvara and I was able to locate the exact mantra in the Sādhanamālā. This section also uses the numeral 2 to indicate repetition, and most of the numerals are surmounted by a chandra-bindu. A text like this was unlikely to have been made to be read. If it was, the reader would be left very confused. Instead, it was most likely produced as a act of merit by a pious Buddhist. Professional scribes churn these auspicious objects out and while we assume they do not deliberately make mistakes, neither are they checking for errors or making corrections. The manuscript might also be an object of worship. The dhāraṇī, like it's early predecessor the parittā, is a form of apotropaic magic and possession of such an object no doubt protects the holder (other Mahāyāna texts make this function of the text explicit by promising protection to anyone who would recite or copy the text). On the other hand, it's entirely possible that the patron and/or the scribe had memorised the text and used it in their daily practice. Chanting in Sanskrit or Pali, by devotees who know nothing of the language, is a feature of Buddhist liturgy. The edition with footnotes is available from my website: EAP676-diplo-edition.pdf. This is still a draft, since no one else has yet looked at it. It's painstaking, fiddly work and, ironically, errors are easily overlooked. If nothing else, this shows the value of putting manuscripts online. They become available to a much broader range of people - including feral scholars such as myself. High quality scans mean I never have to touch the fragile ms. itself and risk further damaging it. I can see everything I need to sitting at my desk. With larger manuscripts there is no longer a risk of mixing up leaves. I've spent a happy week examining this text. I'm grateful to everyone involved in putting this manuscript online, especially the British Library Endangered Archives Project and the owner of the manuscript, Shanker Thapa. My other Heart Sutra essays, some graphics and my working bibliography are listed here (or under the tab at the top of the page). Thanks for reading and all the best for 2015.